Wushu (武术) is a modern Chinese martial art that blends elements of performance and martial application. Wushu training emphasizes strength, speed, explosive power, flexibility, and precise technique. Several elements of Wushu are derived from the traditional Chinese martial arts. This club focuses on taolu, or forms. We start off by learning basics, then progressively learn more intermediate forms (such as compulsory). No experience is necessary to join Wushu Club. We perform at several events, including CEO's International Explosion and UHVSA's Vietnamese Extravaganza (VEX) charity event. 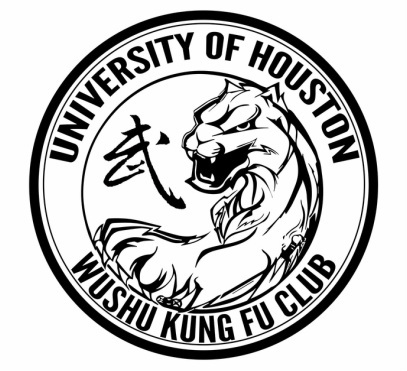 We also compete with other colleges and provide an opportunity to train for martial arts competitions. In addition to performing, our club focuses on helping the community through volunteer service. No experience is necessary - beginners welcome! There are some forms that you must fill out before you may participate in any practice. These will be provided for you. You may try class for one week at no cost. We accept cash, checks, credit card payments, and Paypal. Members receive points for attending practices, performing, volunteering, and wearing the club t-shirt to events. Raffle tickets for prizes will be awarded for points at the end of each semester. It is also advisable to wear ﻿shoes that allow for more flexibility of the ankle﻿ in order to prevent some injuries. For example, basketball shorts, a t-shirt to work out with and shoes to work out with. Uniforms are required for performances. Performance uniform shirts will be available to members for $15 if not purchased at the beginning of the year as part of the $45 annual membership package. Men's and ladies' shirts will be available, and yo﻿u may choose whichever type you prefer. Kung fu pants will be provided by the club at performances.